Finding a pilot job that pays a lot is great! But high paying jobs can cost you. Consider these key things when negotiating your pilot job offer. It’s the best and worst scenario. You’re staring at a high paying pilot job offer. It’s offering you the keys to your happiness, getting everything you’ve always wanted. But something isn’t sitting quite right with you. The employer seems … just ok. The job duties sound like a little bit much, and the schedule is out of hand. Maybe things are a little not-OK with this job. We put together some red flags that should help signal whether or not you should really turn down all that money. 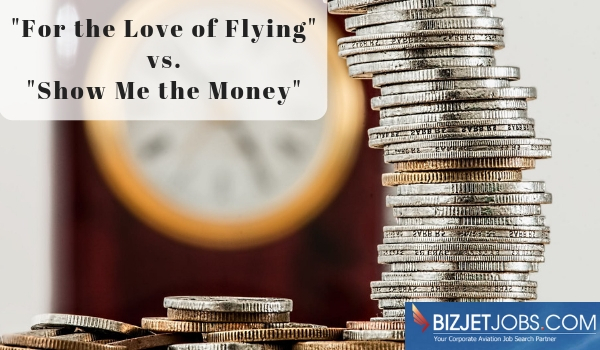 At BizJetJobs, we believe money definitely matters. But this is your life we’re talking about. At the end of the day, you want to be happy. So if any of the following happen to go hand-in-hand with your high-paying pilot job offer, think twice before you accept. Time is money. Factor in the hours you are expected to be flying, at work or available at a moment’s notice. People sometimes look at the dollar value of the salary without considering how much of their lives this job will encroach upon. Things like an 80-hour work week, no support staff or a boss who seems mean can take a real toll in the form of job satisfaction. It’s true: corporate pilots typically have more in terms of “extra-curricular” duties than their commercial pilot counterparts. They may be expected to keep track of fuel costs, negotiate hangar rates and stock the plane’s soda cooler. But if you are expected to do everything from flying the plane to picking weeds outside the hangar, take note. This type of stress can make you miserable and have long-term health effects. Keep the 2015 Gallup survey in mind that showed people who use their strengths in their careers are three times more likely to report having an excellent quality of life, six times more likely to be engaged at work, and 15 percent less likely to quit their jobs. Research also shows that employees who use their strengths outperform those who don’t. So if your strengths are on the back-burner, you might be both personally miserable and lousy at your job. Not a good combo. Don’t get so starry-eyed over a high salary that you end up overlooking some of the most critical aspects of the pilot job, like corporate culture. You’re going to be their corporate pilot, but what do they sell? Is it something that grates on your nerves, or value system? Is the CEO someone you would enjoy being friends with? How long has he been with the company? Also look at the Director of Aviation. Are any of your “bosses” from the CEO down close to retirement? This could signal massive upcoming shifts in corporate culture. Are the CEO & Director brand new? If they are, find out where they worked before and what they accomplished there. Could be a good thing, or maybe not so much. They were hired to accomplish something. Do a little homework to find out what that is and how it will affect the future of the Flight Department. How is the company performing? Is a sale or acquisition in the near future? If the company is publicly traded, how are stocks performing? Look at any resources available online, like call transcripts from quarterly earnings call transcripts or stockholder meeting minutes. You can get a good sense of corporate culture and values from these resources. How big is cost-cutting to your prospective employer? This might be a red flag, as Corporate Flight Departments are often on the chopping block. Is anything going on at the company that you find unethical, or could keep you up at night? What is the company’s mission statement? Can you get behind it? How does the company treat people with different religious or political beliefs? How does the company treat minorities, women or other groups you care about? What is the company’s position on environmental stewardship? Would you feel proud to tell a non-pilot friend of yours that you work for this company? “Crossing the line” is different for everyone. For most of us, money can’t offset the negative feelings we’ll have when we compromise our personal value system or beliefs. High-paying jobs can be great, too! Use the tips above, or if you’re not sure, give us a call. At BizJetJobs, we pride ourselves on being the corporate pilot advocate, helping pilots find the best, most well-suited jobs in the industry. We recognize that every pilot’s wants, needs and desires in a pilot job may be different, so we have tools to help our pilot Members find their ideal match in terms of location, schedule, aircraft, types of trips and more. We’re happy to be a sounding board or provide feedback for our job-seeking pilot and flight attendant Members. Bottom line: don’t sacrifice your health or happiness for a paycheck. It’s never worth it! This entry was posted in Blog, Career Advancement, Job Search, Pilot Advice, Pilot Jobs, Pilot Transitions, Salary by Amanda Jenkins. Bookmark the permalink.